nb I don’t write reviews because I’m usually too catty right out of a performance. ‘What. What. What are you wearing?’ is an hilarious fictional catchphrase, not a suitable way to discuss indecipherable costume design. And I’d like to work in this town. In theatres. Also, some time after watching it, my thinking about a performance scatters across unrelated editorial readings, dramaturgical questions, and critical interpretations. 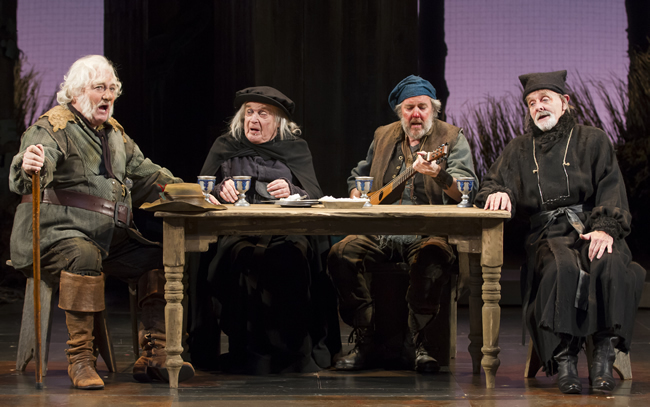 What follows is not a review of Shakespeare Theatre Company’s current repertory productions of Henry IV, Part 1 and 2. I repeat: this is not a review. Early modern history plays are a little funny here in the USA. There’s a sense that though we understand their historical nature/virtue/import we do so without experiencing an instinctive emotional response. Our history hadn’t even been imagined yet when these men fought at Shrewsbury. Analogies are complicated, so ‘updating’ the plays rarely makes sense. There’s no collective identity for us to watch unfold or crumble or emerge onstage, no sense of the national psyche Michael Billington found in Nicholas Hytner’s 2005 doubleheader. So instead of bogging down in the quagmire of lords and shires, why not clear a path to the people and relationships we can identify? Director Michael Kahn intersperses lines from Richard II throughout both parts of his production. In fact, Part 1 opens to Henry IV standing alone onstage, listening to a voiceover (unrecognizable to most audience members, and uncredited in the programme) of Richard’s deposition scene lines. It makes intellectual sense to recall Richard at Henry IV’s every political turn, and, by Part 2, it doggedly reminds us just who is the title character. But if we’re interpolating text, why not make the Q title page promise of a fight between King Henry and Harry Percy a direct continuation of the civil war simmering since Richard II’s deposition? * Why leave the lines as ominous pressurizers on the King’s relationship with an absent son? Americans understand dynasties, and generational miscommunication, and rebellion. Give us that. I’ve been watching plays at STC for about 5 years now, and I notice that directors working in the Harman have difficulty resisting the use of automation. 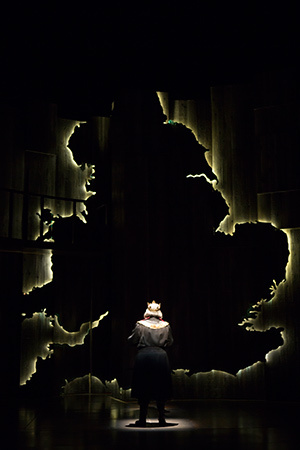 Looking at the massive backdrop, I assumed it would somehow at some point – once I saw the map outline glow I was sure it would happen: the map would split in two when the play, like the country, could no longer brook the tension between England’s princeliest, and civil war began again. The map did split, but at no particularly poignant moment. It merely broke open to alter the stage. Practically speaking, the newly widened entrance upstage centre allowed for groups (e.g. armies) to move as units. Dramatically, in a production already showing some cards with melodramatic voiceover memories, the set just sat. Hotspur (John Keabler) gave a very clear exclamation point after ‘Revolted Mortimer!’, an editorial choice found (at least) in the Folger, Oxford, and Riverside editions (Ox: 1.3 93). The short line spits back the King’s final words. There are ways, I grant, to deliver a line ending with ! with shades of wonder, surprise, or anger. But I’d argue that actors have a harder time pulling back from an ! than they have colouring a ? with excitement, confusion, or outrage. At any rate, editors, take note: the EM ?/! substitution may be fluid, but should be used with great caution. I spent all of Part 1 and half of Part 2 wishing STC had hired Kate Skinner (who played Dol Common in the 2009-10 The Alchemist) to play Mistress Quickly, only to realise at intermission that they did that very thing. What happened, I wondered, to transform her quick-witted, street-smart, con-artistry into the shouting, crying, flailing tavern keeper whose relationship to Falstaff is… totally acrimonious? Again, the Hollow Crown Henry haunts me: Julie Walters played the best Quickly I’ve ever seen. The most melancholy, most hopeful, most hopeless, most malapropping. Since this isn’t a review, I keep myself to only this: as I’ve said before, and will no doubt say it again, malaprops only work when you’re earnestly using the wrong word. You cannot play it as the wrong word. Any hint of linguistic manipulation, and the audience loses the joke. A dash of irony or sarcasm over seasons the dish. How pitiable and pointless would Dogberry be, if he knew how little he knows? Stacy Keach, Ted van Griethuysen, Brad Bellamy, Bev Appleton. Photo credit Scott Suchman. And, yes, Mr Keach is an excellent actor. Audiences of a certain age remember that; DC audiences who were here for the Goodman/STC co-pro of King Lear in 2009 remember that. If you need a reminder, check out his dive-bar stare-down with Bruce Dern in Nebraska (2013). Much has been made on the interwebs about his first time playing Falstaff. He was a young man then. I wish more than anything I could see a video mashup of these performances. In my imagination, younger Falstaff is vibrant and spry and joyous in his iniquity; in my memory, older Falstaff is steady and stable to a fault. But let that pass. *This is a recurring problem I had watching the performances: a desire for someone, somewhere, to make an explicit choice. Stop hinting at a year, at a location, at a relationship. GIVE ME A STANCE. Then reject it, modify it, destroy it, die for it, die with it. The sun is not ambiguous though clouds hide it from our eyes. **Transitions in Kahn’s 2010 Richard II were elegant, a choreographic joy to watch from anywhere in the house, though especially appreciated with a bird’s eye balcony view. ***Rumour was dressed in contemporary clothing, and held a tabloid reading ‘ELVIS IS ALIVE’. That he appeared so un-like the others in the play makes a certain allegorical sense. That he was so easy to identify while others were obscured by unfortunate costumes and wigs begs answering. Previous Auditor registration now open!